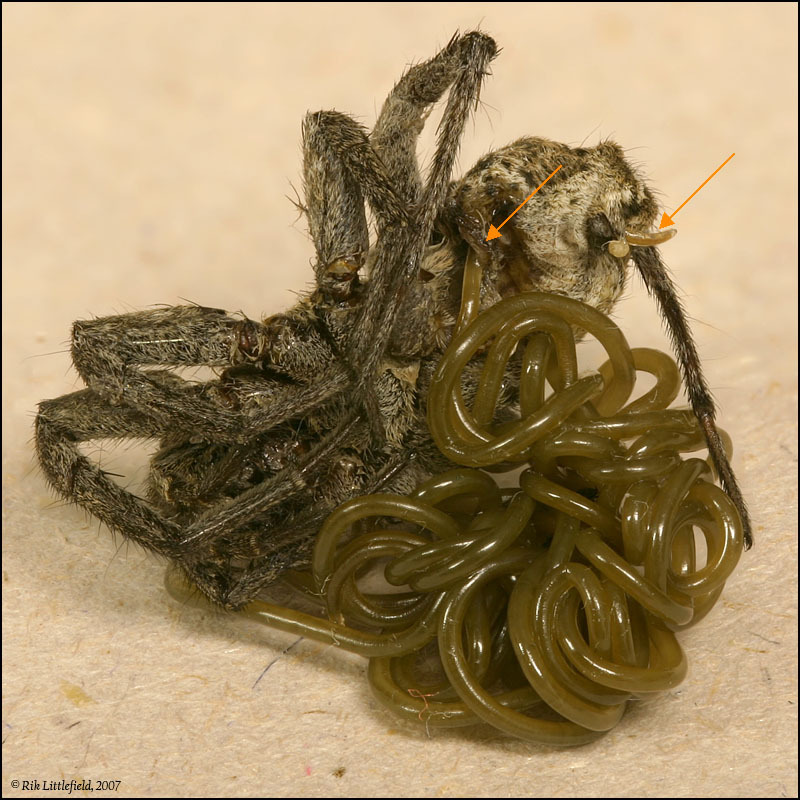 Several days ago, Sue Alden posted a picture of what might be a horsehair worm, and I learned about these long worms that parasitize insects & other arthropods. So I was prepared, when today one of the folks at work called to say that they had something weird for me to look at. The worm was already dead when I got there, but the caller (who asked to remain anonymous) said that at first the thing looked like a spider that had gotten partially squashed, and its guts had fallen out and were still writhing on the floor. Any further thoughts or interpretations? Technical: Canon 300D, Sigma 105mm macro at f/11, stacked. The spider + worm are about 15mm across. This is amazing. What an awful way to meet one's end. I do not have much time this morning, but I did find this article that might help with the ID. Oh yuck! "Hurl Hurl, gag!" That is an interesting bit of photography there Rik. Quite an unusual find, though some things are just plain gross and this is one of them. Glad you posted it though. I have never seen anything quite like this Rik. Most interesting. Very interesting and well documented, Rik! It´s always amazing to see what an enormous size such a parasite can grow to within its host. Imagine oneself would have such a monstrous wriggling hose inside one´s tummy! Now, in the literature one can read that these parasites, when adult and ready to leave their host, manipulate the host´s behaviour in such a way that the host approaches fresh waters like ponds, ditches etc. This said, it would be interesting to hear where the people found the spider with the worm emerging. In an office, on the carpet. This building is several hundred feet away from any standing or running water that I know of, unless perhaps there are puddles on the roof. The travels of this worm must have been quite a saga! Now this really is one to make you squirm. A neighbours Cat was sick in our garden this morning. Closer inspection showed that the sick was full of worms, and I thought that was bad. Admin edit: removed unusual smilies. Today is the tomorrow you worried about yesterday... and all's well! Interesting and just so unique Rik. Fascinating behaviour shot. Never seen anything like it and it must use the spider as a host. INCREDIBLE !!! PS: We don't want large animated gif's coming in here. Please use the ones available only. Just like the rest of us do. Interest in these pictures seems to be more widespread than usual, judging from both the view count for this topic and the number of emails that I have received about it. Regarding the ID, consensus seems to be that this parasite is much more likely a "mermithid" worm (Nematoda:Mermithidae) than a "nematomorph" or "horsehair worm" (Nematomorpha). Those are very fine images. Nevertheless, they are not sufficient to identify the worm with safety. Mermithids and nematomorphs are very similar, but I can identify no character that would point to one of the two. I suspect it to be a mermithid, but can not be very sure. The most reliable would be to send the worm to me and let me have a look directly. Sorry - this is all I can say at the moment. Juvenile nematomorphs may look a lot like mermithids, but probably these features help already. Dessication is usually not a problem, because the worms are quite robust. Abstract. A mermithid, a parasite of a spider (Araneae: Thomisidae) in Baltic amber (40 mya), is described as Heydenius araneus n.sp. (Nematoda: Mermithidae) and represents the first fossil record of a nematode parasite of an arachnid. 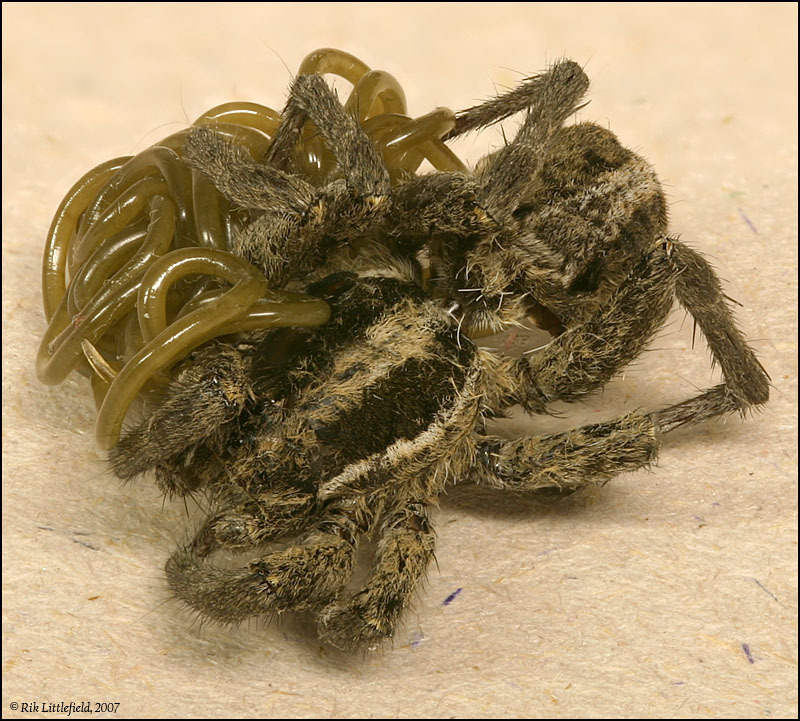 After a critical examination of reports of naturally occurring helminths of extant spiders, I conclude that although mermithid parasitism is well established in this host group, previous reports of hairworm parasites of spiders are "nomina dubia," putative records, or refer to mermithid nematodes. I was curious how these various groups relate to each other, so I did some searching. What I found is that Nematoda and Nematomorpha are sister groups, both being phyla within Ecdysozoa, a large group that comprises all the animals that shed an exoskeleton. Ecdysozoa includes such other well known and quite diverse groups as the Arthropoda (insects, spiders, etc.) and Tardigrada (water bears). So it seems that despite their very similar appearance, the mermithid and nematomorph worms are not very closely related. Fascinating. PS. The article linked above by Sue Alden (this one) provides a wealth of information about these parasites. Thanks, Sue! The more I look and the more I read, well this is one of the most amazing posts I've seen on any macro forum (and I've seen a few ). This one actually takes the cake........ with cream. Facinating, and very well shot rik, actually made my day . And salden thanks for posting the paper, really makes the thread. I love this place sometimes . Grusome and facinating and beautiful pictures all at the same time.